Metalgrigliati Srl offers productions of gratings, light carpentry, production and marketing of fences, wrought iron, stainless steel, perforated plate and expanded metal of iron. 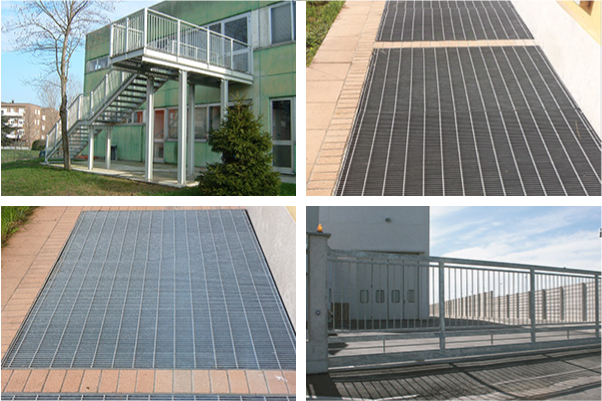 In particular deals with walkable welded and pressed gratings used in various industrial, mechanical, constructionapplications, manufacturing and marketing wire mesh rolls fence, welded steel mesh fence, welded grating, tubular gates, linear and spiral staircases, mobile panels for building sites. We use treatments thermosetting polyurethane powder coating color requested by the customer and the quality standard is also particularly high thanks to the treatment of hot dip galvanizing carried out at the Company’s group “ Zincatura e MetalliS.p.A. "